As a team leader of a small group of professionals at the investment bank where I work, I believe it is important to develop relationships with those that report to me that extend beyond the requirements of the job. As part of this I enjoy taking my team out to a group lunch or for drinks from time to time, and I choose destination restaurants known for their excellent food, high level of service, and attractive decor. I make sure to keep the conversation light during such outings, refraining from speaking much about business, if at all. The focus during these get-togethers is on eating and drinking well, and catching up on what people are doing outside of the office, their families, vacation plans, movies they've recently seen, and books they are reading. In other words, having a good time. This year I decided to take my team out for a particularly nice lunch to celebrate the holidays at the last great bastion of old-style, formal, French dining left in New York: La Grenouille. I've eaten at this classic beauty any number of times over the years, both for business and pleasure, and thought it would be an ideal place for us to wile away several luxurious hours on the last friday before Christmas, with the explicit instructions that no-one was to return to the office afterwards. When I first started working in New York after college, the uppermost echelon of the City's top restaurants was dominated by five of the most formal of French restaurants imaginable: Lutece, La Caravelle, La Cote Basque, Le Cirque, and La Grenouille. Each was rightfully famous for impeccable service, gorgeous interiors, and exquisite, Escoffier-based cooking served by armies of formally-attired waiters and their assistants gliding about the rooms. Each was also overseen by a Maitre d' or owners whose understanding of their patrons' wishes and expectations exceeds anything seen today, and where the welcome and service extended to regulars was so solicitous as to defy imagination. If, on the other hand, you were not among the restaurant's inner circle you could--in certain of these restaurants--find yourself relegated to a less-than-desirable table where service wasn't quite as superb as what was provided to cherished regulars. In other words: Siberia. Reasons for such treatment might include being too young, appearing to be too obviously from out of town, arriving wearing less-than-fashionable clothes or dressed too flashily, the subject of a scandal recently reported in the newspapers, or something as trivial as entering the restaurant a bit too tentatively--evidencing a less than ingrained comfort with dining in such an establishment. I've experienced life both among the Inner Sanctum and in Siberia in these establishments, and believe me--the Inner Sanctum is where one wants to be. But times and tastes change and of this crew only Le Cirque and La Grenouille remain. In my view, though, only one of these two truly qualifies as the last of the real deal, and that's La Grenouille. Despite Sirio Maccioni's legendary hospitality at Le Cirque I've always felt like an interloper in the half a dozen or so times I found myself dining in its peripatetic, oddly-decorated rooms. Sure, the food is fantastic, but there's a reason they call it Siberia: it's cold there. On the other hand, every time I have had the fortune of dining at La Grenouille Charles Masson has demonstrated a hand so deft at making me and my companions feel beautifully welcomed that I want to return to it again and again. 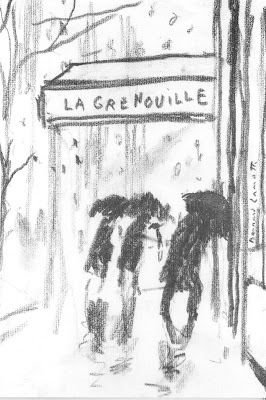 But what makes La Grenouille so special is the entire experience one has from the moment one enters its doors to when one reluctantly bids it farewell. In other words: it's Heaven. It begins with a lovely welcome to a gorgeous interior with extremely flattering lighting, and a justifiably famous display of astonishingly beautiful flowers. And then there is the food. It's sublime. After consuming a perfectly made Beefeater martini straight up with olives, I started with an endive salad with pears, walnuts, and Roquefort cheese and then followed it with grain fed roasted chicken "Grand Mere". While both of these are staples found on the menu in virtually every French restaurant I've ever eaten in, they emerge from the kitchen at La Grenouille transcending the ordinary versions found elsewhere. It's a whole different league. The roast chicken, in particular, was a joy: succulent and juicy, golden crisp skin, perfectly seasoned. This kind of simple, straightforward cooking takes many, many years to perfect. Since La Grenouille is famous for its dessert souffles and we were in a celebrating mood, each of us ordered one in a different flavor, giddy with excitement. Mine was pistachio. Incredible. And the place was packed! Every table was occupied, and I saw at least four or five bold-faced names that regularly show up in New York Social Diary. Everyone appeared to be having an absolutely lovely time. And that's what you too can expect to have when you dine at La Grenouille, the last of the grand French restaurants in New York. which I hate. I want service not a friend! A waiter should have a name tag so that you can address him by his name if need be but his service should be almost silent -- filling water glasses when they are half full. Ah, to have dinner in a grand old dame would be splendid. You made me want to dine at La Grenouille. But what really struck me was the lovely pencil drawing at the beginning of the post. It's so beautiful! Ah Reggie, you are indeed a man after my own heart...first the linens and now this?!!! 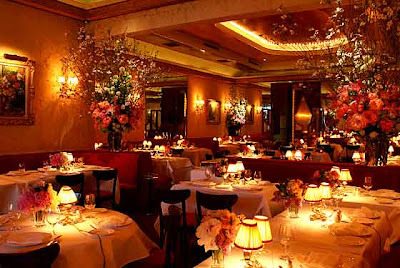 I also worked for an investment bank (many moons ago) and frequently entertained and was entertained at La Grenouille. You are very correct, not only is the food sublime but the total experience is one you will not encounter anywhere in NYC or for that matter, the world. If Charles Masson is the ideal host, his mother Giselle was the epitome of charm and grace. She made it a point to go around the room (the inner sanctum, of course) once during the service and stop at every table to say hello. As to Le Cirque, my feelings reflect yours. My favorite lunch entree was the cheese souffle which created quite a problem if they had pistachio for dessert. If you are dying to serve Chicken Grand Mere at Darlington House, there is a great recipe by Daniel Boulud's mother in my blog http://lindaraxa.blogspot.com/2009/07/celebrating-bastille-day-chicken-grand.html I'm sure it's a close second to the one you had. Keep writing im enjoying it! As a new New Yorker (3 yrs now) I am using you as a guide to my new city. I'll be dining at Le Grenouille for my birthday lunch! Only ever made it to Le Cirque... and Siberia. Now I have a destination for our next visit to the City. What a lovely place it must be. Don't worry, we'll wear something warm. 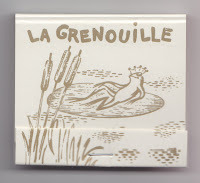 I assure you that you will have a lovely time at La Grenouille. Please do let me know after you go how it was. I remember going with my cousin and her then 10-year old son. The table was full of adults, all noisily chatting away. We all ordered, and when it came time for my young cousin to choose, he simply closed his menu, looked the waiter straight in the eye, and very clearly asked for the bouillabaisse. I am not sure I would have known what bouillabaise was at his age, much less have been tempted to try it. But, he did! Reggie! I am a fan! I am Penelope! I have a La Grenioulle story! You know I could not make it up! First time: I am pregnant with my daughter (she turns 43 April 2nd!) YES!! 43 years ago! How many restaurants have been stellar for this many years?? 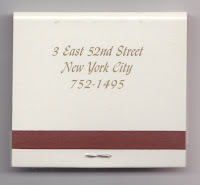 I was 23; and my parents came to NYC (we are from California) and that is where I asked to go to dinner! I had read all about the flowers!! My favorite place to dine! and the most beautiful flowers I have ever seen to this day! What a lovely progression of family and values! Have You Met Mrs. Roles?